Well, you can't please everybody. Commenter RD also ridiculed Shahril for not addressing the 1MDB affair or at the very least mention that name Jho Lo in his letter. To me that shows how focussed Shahril is but if you guys are really interested, still, after all the explanations and after all these years, listen again to what PAC deputy chairman YB Tan Seng Ghiaw said about 1MDB and PM Najib Razak after the Commission's lengthy investigation into the 1MDB affair. Seng Ghiaw ni DAP totok, ok! Original airtcleHere's why the unpolished gems in Umno should be allowed to come out more often to air their views. This letter to the editor published by the Malaysiakini penned by Shahril Hamdan is an excellent read, someone who does not care much for Umno told me. I blogged about the 31-year old exco member of Umno Youth once (The day Syed Saddiq made a name for his opponent, Sept 2017). Dira Abu Zahar is the other "star" in Puteri Umno who came out, seemingly out of nowhere, to shine. Mahathir is doing all this for Malaysia, right? COMMENT | I refer to the Malaysiakini article titled Mukhriz: Dad threw a fit when Umno tried to field me in election. I find Mukhriz Mahathir's claim that his father, Dr Mahathir Mohamad threw a fit when Umno tried to field him as a candidate in the 1999 general election most amusing. For starters, the late 1990s is now subject to some pretty extreme historical revisionism by Mahathir. So I wouldn't put much stock in what he says he did or did not do in that period, since the versions change dramatically every so often. But if we are on the subject of Mahathir throwing fits, the public should also be aware of the metaphorical one he had in more recent memory - when his son lost the bid to become one of the three Umno vice-presidents. Might it be coincidental that, at that moment too, Mahathir stepped up his attacks against Umno and the prime minister personally? If one didn't know better, one might say that Mahathir took his son's loss as a personal affront by Najib Abdul Razak, whom he perceived to have helped the three incumbents retain their spot. If one didn't know better, one might find this perception ironic, considering the iron grip Mahathir himself had on Umno in his decades as president - deciding who wins what seat where and when. If one didn't know better, one might assume that Mahathir was further affronted by the fact that one particular person, Khairy Jamaluddin, did in fact very publicly campaign for Hishammuddin Hussein to the clear electoral detriment of Mukhriz in that close contest for the third VP spot. If one didn't know better, one might say that Mahathir never got over the fact that after so many years of trying to “end” Khairy, the guy just wouldn't go gently into the good night. But instead, he had the nerve to try, and then succeed, in defeating Mukhriz in the 2009 contest for Umno Youth chief. If one didn't know better, one might say this latest intervention about stopping his son contesting as a candidate in 1999 is vintage Mahathir, acting out the concerned, principled, elderly statesman routine that belies the master craftsman of a politician he actually is. He who uses everything at his disposal and pulls every emotional string at the most opportune times to secure what he truly wants – an unassailable legacy, Lee Kuan Yew style. Alas, I guess we in BN ought to know better. 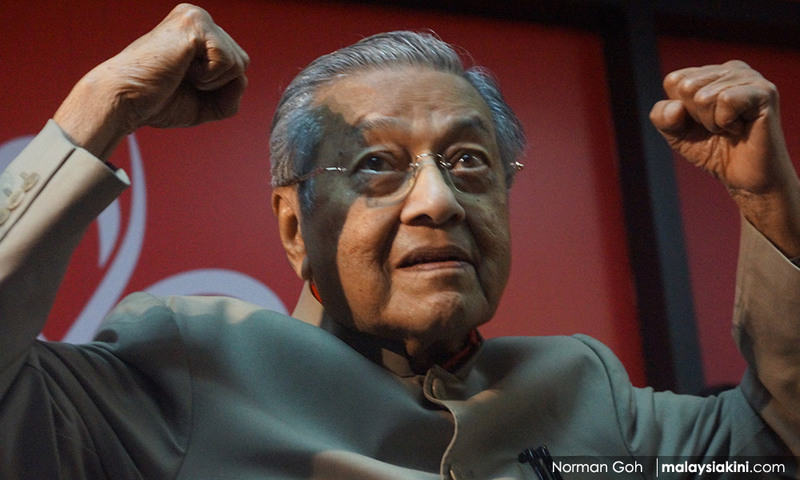 Because surely Mahathir would not have the audacity to quit the party, rejoin and then quit again, form a new one, eat his own words, make countless bewildering U-turns on everything and culminate in signing off on a manifesto that essentially seeks to undo his own policies in office - for his own personal gain. Surely we ought to know better. This has nothing to do with his narrow agenda or vendetta. He's just not that type of person, right? He's doing this for Malaysia, right? SHAHRIL HAMDAN is an Umno Youth exco member. Ehmmm... not even a words from Shahril Hamdan about 1MDB-Jho Low scandal which resulted in Dr.M quitting UMNO or that Mukhriz lost the 3rd. spot of VP race to Hishammudin, but won the popular vote. That Pahang's Palace openly supported Mukhriz's rival and it took too 12 hours or so to count a couple of hundred votes. Funny you asked about 1MDB because the video quoting Tan Seng Ghiaw, the DAP veteran, and PAC deputy chairman, has resurfaced. Re-listen what he said back then ..
As for Dr M quitting Umno, it was for a variety of reasons. One of them was BR1M. He felt very strongly against it. He said government should not be giving money away to the people just like that. Another was Altantuya. Sirul Azhar's mother had met Dr M who promised to take up the issue, if you remember. 1MDB has always been DAP's "baby" so Dr M didn't go all out on that issue. Until, I suppose, he decided that his opposition towards BR1M would make him unpopular (see Pakatan Harapan's manifesto, they have their own version of BR1M!). As for Sirul and Altantuya, I haven't heard Dr M mention either for a while now. UMNO-PAS malay can lie to to muslim malay in such stupid manner is a blessing from Allah!! No malay bias run administration or nation is ANY good in this world!! Yes I agree that Dr. M left UMNO for a variety of reasons, including BR1M which he once strongly against. It must have been an eye-opener for him too, of Najib's Cash is king strategy to be popular, winning votes at it. However, after one year into BR1M, Dr.M still went on to campaign for BN against Kit Siang in Gelang Patah, didn't he? As to your supposition that Dr. M switched over to 1MDB-Jho Low, because his opposition to BR1M would make him unpopular; well that's something I could not dispute since I'm not privy to the old man. To me, the last straw that broke the camel's back in Dr.M were, MCA's political dealing and relationship with Communist Party of China, selling Rakyat's assets & prime-land, Freehold kondo in Forest City, ECRL, Mini-Great Wall in Kuantan and Najib's over reliance on hutang-investment. Nonetheless, Najib's BR1M had been etched in stone, once implemented and I'm very sure Najib haven't thought it out wisely. I suppose nobody could do away with BR1M without loosing popularity, unless war broke out on 3 fronts as what Matthias Chang posted on Jan 9, 2017, at URL as below. He even warned Chauvinist Malaysian Chinese that when it come to push & shove for the survival of the country, he will stand with the Malays. If you haven't seen it, please hear him out Dato, especially from minute 17:00 onward. It's March, Let's read The Quran!